Be direct with interview questions that get to the heart of the matter by asking the candidate if they have any interest in learning how to manage or becoming a leader. There’s been a lot of talk lately about a lack of management skills brought on by the exodus of the Baby Boomers from the workplace, coupled with many Millennial’s lack of experience and soft skills. To help close the leadership gap, we asked professionals to share how they discern a job candidate’s willingness and potential to develop management and leadership skills in the interview process. 1. Before you start your search, know what leadership and management look like in the organization. To spot potential leaders and managers, first define what skills and capabilities good leaders have. Without those standards, each individual making hiring decisions will apply their own beliefs, says Cheryl Pinter-Veal, head of Deloitte’s NextGen Leadership Development Program. To get a step ahead of other recruiters, Deloitte’s NextGen program targets students as early as freshman year and looks for early signs of leadership potential. “We scout in particular areas that are demonstrable -- their values, characteristics, the ability to lead teams, and the knack to influence peers,” Pinter-Veal says. 2. Ask people straight up: Do you want to be a manager? During the interview process, hiring managers should directly ask job seekers if they’re interested in managing others. “Being straightforward, rather than navigating the intricate results of a comprehensive personality test, can yield positive results,” Scott says. 3. What to do when a job seeker lacks management experience. Managing a project requires task-related and people-related skills. 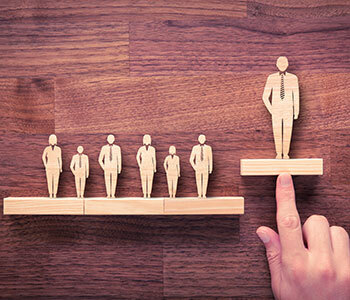 Leigh Steere, co-founder of Managing People Better, LLC, suggests using a person’s preferences for those responsibilities to evaluate leadership potential. Steere makes a list of task-related items (creating a work breakdown structure, managing a project budget) and people-related items (meeting with team members to get input, reviewing and giving feedback on project team members' deliverables). During interviews, she asks job candidates to rate how much they like doing each task on a 1-to-10 scale. “If the candidate's responses suggest a strong preference for tasks over people, he or she is unlikely to find job satisfaction as a people manager,” Steele says. You can adjust the question to fit experienced managers by asking, “What are your favorite aspects of project management?” Observe if they mention people-related or task-related items. 4. Listen for "We did this" vs "I did this." Recruiter John Malloy, president of Sanford Rose Associates, Santee, South Carolina, found out just how effective this trait can be in a recent candidate search. A global medical device supply company needed to replace a 25-year veteran material manager whose team included a dozen people who each had at least 15 years of experience. The more experienced candidates lacked the newest ideas and tools. The less experienced candidates lacked the ability to gain the respect of the experienced and competent workforce. One resume caught Malloy's attention -- a candidate with a master’s degree from MIT. He was asked a key interview question: “Tell me about the project you are proudest of in your career.” The candidate explained how “his team” installed a new software system at his first company and smaller projects where “his team” helped make things happen. “He described situations that could have easily been attributed to a single person, but he came across explaining how he let ‘his team’ take credit for the accomplishments,” Malloy says. The lesson: leaders talk about team building, rather than focusing on individual accomplishments. 5. Ask interview questions that reveal character. Ben Mulling, chair emeritus of the Institute of Management Accountants and chief financial officer of TENTE Casters, Inc., a Hebron, Kentucky multinational manufacturer, recalls how ethics helped him choose an intern from a group of professionally inexperienced applicants with similar college transcripts. During the interview, he asked applicants to talk about a time they faced difficult circumstances. The student who landed the internship spoke about becoming his fraternity’s treasurer, then realizing the chapter was losing money. He ended up having to kick out brothers who didn’t pay their dues, including some friends. 6. Seek out those who try hard and embrace management tasks. Mulling once hired an entry-level accounting graduate because the student sat for the Certified Management Accountant exam during his senior year, a time when some kids are coasting to the finish line. Plenty of high school grads are ambitious. Look for folks that have completed a management-in-training program or earned a technical certification, Mulling says. He checks for those who have a vision for the future that includes management or leadership. 7. Entrepreneurs often have leadership and management skills. Central City Integrated Health, a Detroit nonprofit providing access to health care, housing and employment services, looks highly on resumes that contain entrepreneurial experience. “It shows initiative and leadership potential,” says Director of Development Shelly Watts. “Several members of our executive leadership team have owned their own business. People who have started businesses have a wealth of connections and are quite resourceful. I joined the executive leadership team last year and was hired based on my experience starting a nonprofit fundraising consulting firm." Uncovering skills and character traits beyond surface attributes is the key takeaway when scouting for strong leadership. Use the interview process to evaluate the candidate’s character, ambitions and personal successes before choosing your next front runner. The results might surprise you.